For residents of Westminster Canterbury Richmond, having the 5-star rated Mary Morton Parsons Health Center—providing short- and long-term care—right where they live is a huge reason to come to our community. It’s an essential component of having a plan for the future, and the full benefits of being able to Live Life Well within a true Continuing Care Retirement Community. It means you can receive short-term care within familiar surroundings as you recover from an illness, injury or surgery. It means you can receive the rehabilitation and therapeutic supports you need easily and conveniently, without leaving campus. It means you don’t have to move away from the community you love—and that loves you—should you ever need long-term care. A healthcare environment that has consistently been awarded a 5-star quality rating by Centers for Medicare and Medicaid Services. 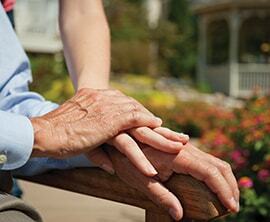 There are very few retirement communities whose healthcare centers receive this ranking. Caring, bonding relationships from devoted staff: Our caregivers love what they do and love where they do it. That means patients benefit from truly “continuing care” from staff who genuinely know their needs and preferences. A holistic approach to healthcare, beyond simply physical health—our programs are created to also benefit emotional, intellectual and spiritual well-being. Residents are also able to enjoy the opportunity to attend our many events. Learn more about our short-term and long-term care—and how our team helps keep you or your loved one involved in life, not just surrounded by care. Click here to contact us now or call 877-277-9908. We also invite you to Schedule a Tour, and explore our Photo Gallery and Testimonials!